Help : The Countries, Regions and Cities Window defines the different entities that can be used in any address field. It defines the format of the address as well as associating Regions with Countries and Cities with Regions or Countries. You would define Countries usually only on System level. Help : The Country Tab defines any country in which you do business. Values entered here are referenced in location records for Business Partners. Reverse Address Lines Print Address in reverse Order If NOT selected the sequence is Address 1, Address 2, Address 3, Address 4, City/Region/Postal, Country. If selected the sequence is Country, City/Region/Postal, Address 4, Address 3, Address 2, Address 1. The sequence of City/Region/Postal is determined by the address format. Local Address Format Format for printing this Address locally The optional Local Address Print format defines the format to be used when this address prints for the Country. If defined, this format is used for printing the address for the country rather then the standard address format. Reverse Local Address Lines Print Local Address in reverse Order If NOT selected the local sequence is Address 1, Address 2, Address 3, Address 4, City/Region/Postal, Country. If selected the local sequence is Country, City/Region/Postal, Address 4, Address 3, Address 2, Address 1. The sequence of City/Region/Postal is determined by the local address format. Media Size Java Media Size The Java Media Size. Example: "MediaSize.ISO.A4" (the package javax.print.attribute.standard is assumed). If you define your own media size, use the fully qualified name. Help : The Region Tab defines a Region within a Country. This tab is enabled only if the Has Region checkbox is selected for the Country. Help : The Cities Tab defines Cities within a Country or Region. Cities entered here are not referenced when entering the address. 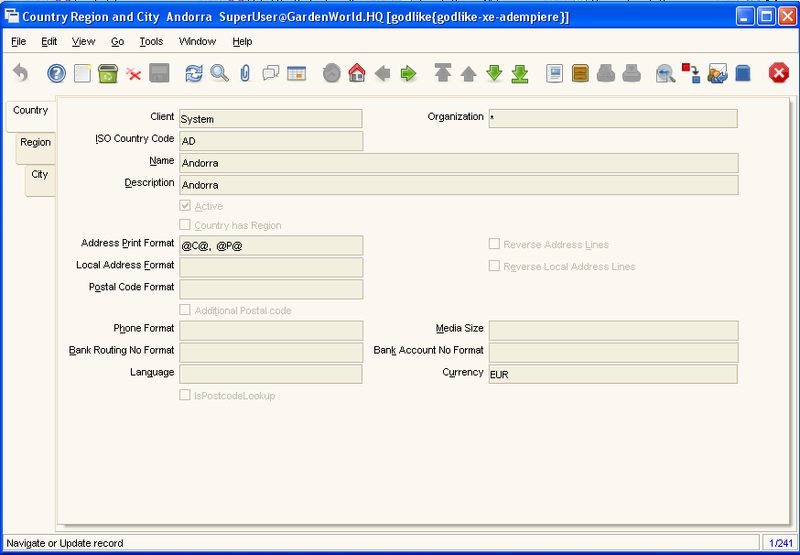 Locode Location code - UN/LOCODE UN/Locode is a combination of a 2-character country code and a 3-character location code, e.g. BEANR is known as the city of Antwerp (ANR) which is located in Belgium (BE).